Jharsuguda : Western Odisha Bandh called by Koshal Co-ordination committee has thrown life out of gear here . 12-hour bandh on Wednesday is being observed in demand of a separate state status for Koshal regions. 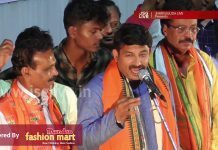 In Jharsuguda, all School, Colleges along with Business establishment were seen closed, The Koshal Supporters had picketed few places like Badmal , Sonarimunda Chowk, Station Chowk, Sarbahal Chowk.